Adding hot and cold towels to your guest offering makes a great first impression. We all know that first impressions count! Clients that have used hot towels have reported increased drink sales by handing out a hot towel to their customers as they seat them and asking for a drink order while people are freshening up. Our 100% cotton towels are easy, refreshing and hygienic. 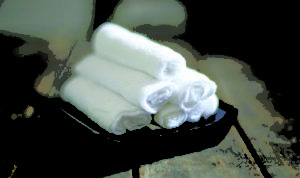 Our towels are pre-moistened and ready to use. Simply put them in your warmer or fridge and serve when ready.